Every day Rachel takes the same train into town and the same train back, and every day she stares at the houses that she passes and dreams about what is happening inside and what the people are like. Rachel has made a life for these people and then all of a sudden, the woman disappears, Rachel finds herself intrigued and needing to find out what truly happened to "Jess". Rachel begins getting deeper and deeper into the lives of this couple and through this investigation of a woman's disappearance, Rachel inevitably begins to confront her own life and the mistakes she has made. As you learn more about Rachel and her life, you wonder what is really happening, and readers are truly taken into a dark circle where you can't tell which way is up. This is really one of those books that not much can truly be said about it, or else the entire story is given away. It is the book that readers really need to experience for themselves and then just pass on to others, it was a book that stayed up reading late into the night because I really wanted to find out not only what happened to Megan, but also what would happen to Rachel and the rest of the characters as the mystery continued to deepen. 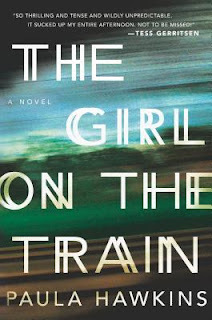 I honestly was nervous about reading it because of all the hype this book has gotten, but I did really love the mystery Paula Hawkins gave me in this story.